Posted August 30, 2016 by Shopping ForHealth & filed under Recipes, Side Dishes, Vegetables / Fruits. Talk to your shoppers about trying new recipes this fall season. Your stores will be bursting with bounty of the harvest season, and included in that bounty is the fall harvest of grapes. 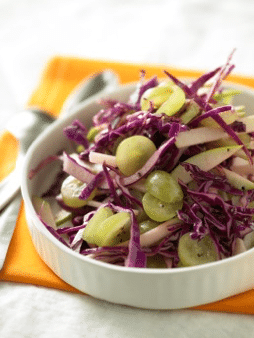 Grapes are in season now through January and offer many ways to add unexpected delight to dishes, like this Grape and Red Cabbage Slaw. It’s a sturdy salad, so you can make it ahead of time and have it ready, or transport it easily for picnics or tailgating. And its crunchy, sweet-tart taste is a family favorite. This slaw pairs perfectly with pulled pork sandwiches. For a speedy dinner, make the pulled pork in a crockpot in the morning before you head out. When you get home, heat the rolls, pull out the Grape and Red Cabbage Slaw and dinner is done. In a large bowl, combine the cabbage, grapes and apple. In a small jar, combine the vinegar, honey, mustard and olive oil. Shake well and pour over the cabbage mixture. Season generously with both salt and pepper and let stand 30 minutes at room temperature. Serve at room temperature or chilled. Nutritional analysis per serving: Calories 91; Protein .8 g; Carbohydrate 15 g; Fat 4 g; 34% Calories from Fat; Cholesterol 0 mg; Sodium 128 mg; Potassium 165 mg; Fiber 1.7 g.